Thanks for 10 Frogtastic Years! 10 years ago the very first version of Camfrog was released. We sure have come a long way since then, and we could not be more proud. We are so excited about our 10th birthday, we wanted to do something fun. We made a special edition 10th Anniversary gift that is, of course, worth 10,000 gift points! Because it’s an special edition, we also made the price 10% off! We’re also so excited, and grateful to all of you, that we are going to be giving these away over the next 10 days, to random users that are online. You don’t have to do anything, except come online and use Camfrog – you may just get a cool surprise! Over the following 10 days, you may find secret coupon codes, to get 1 year of Camfrog Pro for only $10! You can follow us on Facebook – Twitter – Google+ to watch for these secret codes. These are super exclusive codes, and only the first 100 people to use them will get it. After 100 people have used it, the code will expire, so keep on the look out! How long have you been on Camfrog? 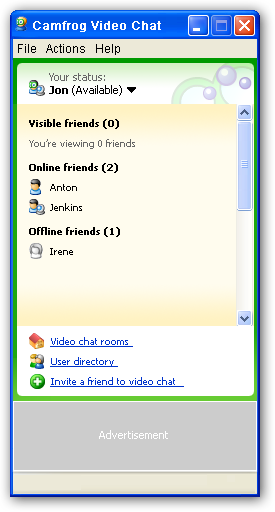 Check out this screenshot of the first version of Camfrog. Maybe you remember using it. Camfrog sure has changed, and we are extremely grateful to each and every one of you, for helping to make Camfrog the awesome video chat spot that it is. It has been a super fun 10 years, and we are excited to server you the best video chat, for another 10 years! Thank you, from the bottom of our froggy hearts, for 10 Frogmazing years! Wow Camfrog you been going 10 years excellent work keeping all the services online with excellent support from you like all ways all the best Happy Birthday. Wish you all the best for your 10th Frogniversary. Wish you all the best Camfrog and Camfroger wherever you are. many people like that and want to play more Frog! Thanks to confor technicians to confor hard work, I thank you on behalf of China, hope camfrog strong go down!!!!! And what do I get next month then I am also 10 years in the camfrog. But Camfrog Happy birthday to and up to the next 10 years. Happy Birthday camfrog, you have made a great effort in business world and in a love world, many couples met in camfrog world, Good job camfrog. I remember when I join Camfrog on October 1, 2003 by one of my friend referred about this and I am sure how much Camfrog is growing better since 2003. Camfrog will never stop hopping around the servers. Look forward for another exciting surprise!